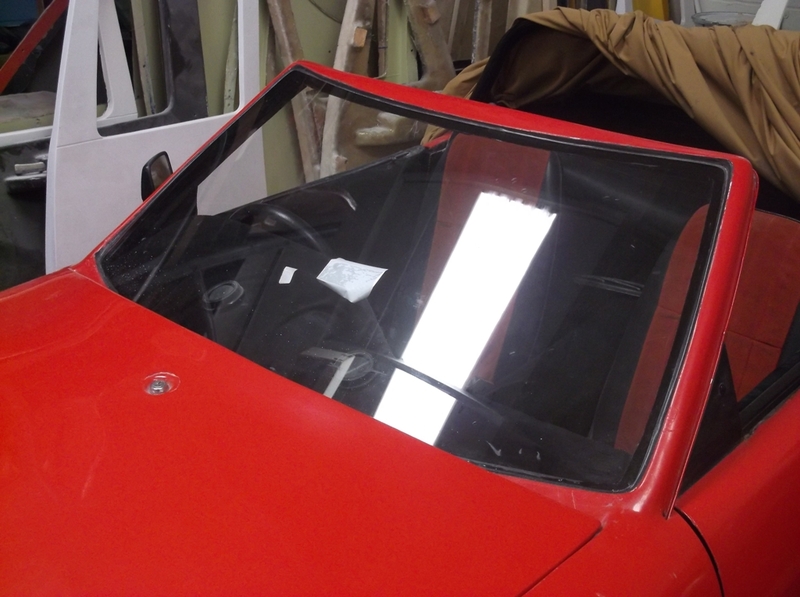 Originally cipher windscreens were made by cutting 10mm off each side of a 1976 Toyota Celica windscreen, however given the present cost/availability these screens and the failure rate experienced in cutting them, making a batch this way was not an option. Fortunately Tony when planning for the future had anticipated this problem and had made a "male" cipher mould that could be fitted into a "female" Toyota Celica mould to make bespoke screen - this had been stored for many years waiting the day it was need. Back last year with almost all the ciphers needing new windscreens, it was apparent that a new set of windscreens was required to stop the cipher disappearing completely from the roads. The cipher owners through the RKR therefore contacted Tony for help. Fortunately Tony had retained the mould and with his kind assistance, and contacts at Pilkington's, was able to arrange a trial to see if the windscreen mould was still good after all these years. Thankfully Pilkington's approved the mould - thus the cipher owners clubbed together and ordered a sufficiently large batch for the price to be a very reasonable £250 per screen. Indeed, given that a lack of windscreens has affected all of the ciphers at one time or another, most cipher owners took the chance to order a spare as well - thus giving a good batch size and allowing a price saving ! 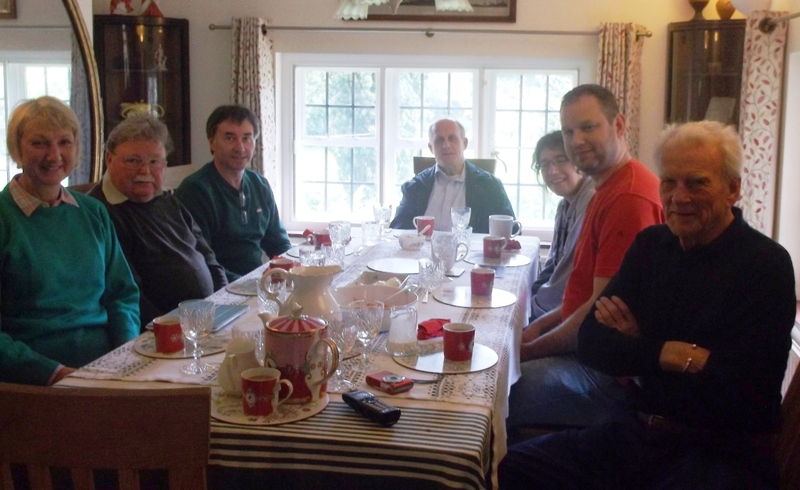 On the day of the 10th, we all travelled to Tony's home, where we met Tony and his wife Jean and were provided with a wonderful lunch (once again many thanks to Jean). During lunch many interesting topics were discussed, including the fact that Tony always intended the cipher to have front disk brakes fitted to the kitten chassis - so Joe Mason's disk brakes are very timely and according to Tony, fitting them is entirely in keeping with the car. It's good to know we can fit them and not feel guilty about completely changing the originality of the car. Another thing that popped up in conversation was the BRM reliant engine, which although Tony hadn't been offered for the Cipher, he felt its characteristics and power would have been ideal for the cipher. It would have been very interesting if a Cipher had gone into production at Reliant with these additions, who knows the SS1 may not have been built! One thing that everyone realised was that it was a very historic day - in all (and including Tony and myself) there were 5 cipher owners in one room - which must be a record! And certainly every cipher owner in the UK was there (one day we'll have to arrange a meeting with our Dutch compatriots!). Tony had realised this and had produced a beautiful scaled copy of the original cipher 1/2 scale drawing for each of the owners - a very kind present and one I know all the cipher owners are extremely grateful for. We then proceeded on to Tony's workshop and picked up the windscreens. We also got to see No.1 (which was fitted with the first of the new screens) and the forerunner to the cipher, the Stevens Sienna. The Sienna, built on an unmodified Kitten Chassis, looks similar to a Tempest - although built many years before (1977). Whilst we were there, the discussion of hard tops arose. Several cipher owners are cipher owners are having trouble with their soft tops, due to age and other issues, and as a hard top was an option at the time having a batch made is a good idea. As mine is fully vinyl covered (and fitted with glazing), a suitable donor to make a new mould was needed. Fortunately Tony had retained a raw fibreglass hard top in excellent condition, and so will be taking a mould from it to make some more new ones. So it looks like as soon as the windscreen project has finished, we now have a new one! Before leaving, Tony gave us each a stainless steel owl logo from his recent range of electric cars, and very kindly donated to the RKR the original Stevens parts manual for the Cipher. This wonderful addition means that the cipher owners now have access to a full and complete parts manual, which should be very helpful to all the current restorations that are going on at the moment! Once again many thanks to everyone and especially to Tony and his wife for hosting us and to Tony for his help in getting the new windscreens made. Fingers crossed we should be seeing a record number of ciphers back on the road by next year. Perhaps just in time, as it was also realised that next year (2015) - will be the 35th anniversary of the unveiling of the Cipher at the 1980 Motor Show (and of the construction of No's 1 & 2) - so all of us have our thinking cap on as to how to celebrate the auspicious date - we'll let you all know when something is confirmed! Cipher No.1 fitted with the first of the new batch of windscreens from Pilkingtons - an excellent fit!